Every year my mom makes this absolutely, amazing, 3-layer, chocolate birthday cake. It makes my mouth water just thinking about it! But eating it, let alone eating a piece of it at breakfast, lunch AND dinner (as I have been known to do) is definitely not a part of my eating plan. I had to mentally and physically prepare to have a slice on my birthday and looked forward to this as part of celebrating my birthday. Until my mom brought the cake over before my birthday to celebrate on the weekend as my actual birthday fell during the week. Now my cake consumption expanded to two pieces with the additional challenge of having the cake in my house longer than expected. The two pieces I could live with, but having it in the house led to a significant struggle every time my kids asked for a piece of cake and every time I saw the cake in the fridge. 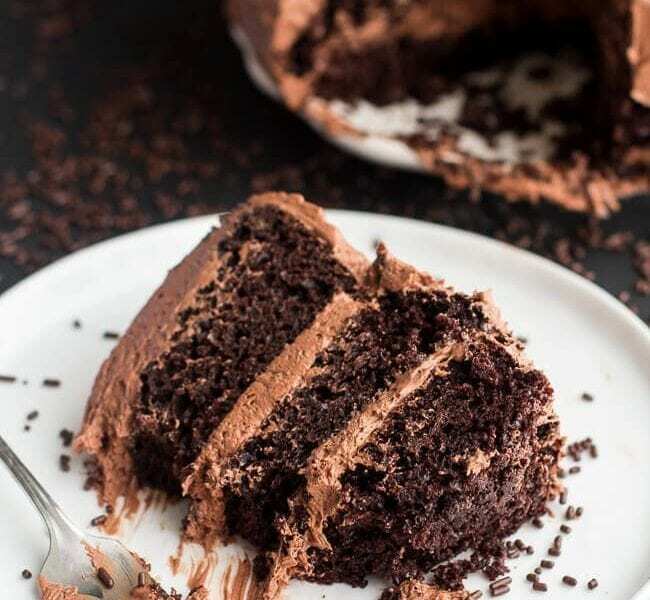 Unfortunately, the way my mind functions, once I have something delicious like chocolate cake, especially more than once, I really start to struggle in making healthy decisions. Cutting slices of cake for my kids, putting their plates in the sink with bites of cake still left on their plates was immensely difficult. So what did I do? I did a combination of things- I probably had 3-4 pieces over the week in total which was more than I intended but I enjoyed every bite. When I had some cake I tried to have it sitting down and really enjoy my cake rather than eating it mindlessly standing at the counter or fridge. I also gave away a big piece of the cake so there was less in the house. Finally, I banished the negative feelings for enjoying my birthday cake which then helped reduce the landslide of additional negative food choices. Going out to dinner on my birthday used to be somewhat of a free-for-all. In my mind, no matter what diet plan I was on in the past, my birthday was a day I was allowed or entitled to eat whatever I wanted. Before becoming involved with Optimally Balanced, I had really unhealthy views and thoughts about food. Even now, going out to dinner at a restaurant can be a challenge because the choices are so enticing and the descriptions make everything sound so darn good. I feel best when I eat pretty low carb and low sugar but boy is it a struggle to just order healthy protein and vegetables on my birthday! However, after really thinking about it, (thinking about how I would feel, thinking about what was important to me, trying to tell myself I could eat whatever I wanted because it was my birthday, thinking about wanting to enjoy my company instead of obsessing about food), I decided I wanted to be able to go home and enjoy my birthday cake after dinner. Birthday cake was more important to me than splurging on mediocre table bread, multiple glasses of wine, or even ordering French fries or onion rings or pasta. So I prioritized, and I found a steak dish that was tasty instead of the pasta alfredo and I enjoyed my cake later. In other words, I balanced my eating decisions. The last major event of the week was probably the event I handled the worst! My friends and I had planned to go out for a girls’ night out to celebrate a few June birthdays. I planned ahead for the evening and decided to have two to three drinks (I wasn’t driving) and to stick to non-fried appetizers in addition to eating very healthy earlier that day. I won’t recount everything I ate and drank but most of this went out the window! I ate and drank much more than planned and really didn’t feel well by the end of the night. I very quickly saw that having a few drinks in my system lowered my will power and my ability to make smart food choices went out the window. Additionally, I then had less energy the following day and had I not been vigilant, it would have been very easy to continue making poor choices. Overall after my birthday week passed my scale rose about 2 pounds and my ability to seamlessly make healthy nutrition choices was certainly tested. My birthday impacted my overall balance because it introduced events that took my schedule out of its routine, inserted foods that are not in my usual routine and brought back a flood of feelings and thoughts about food. My birthday also reminded me of how aware I need to be on a regular basis because for me, it is really easy to fall back into old habits and routines. I know that for me, a few extra pieces of cake can lead to a snowball effect of increasingly poor food choices and skipped workouts. I am a work in progress and I chose today to continue moving forward!